Just would like to know your opinion or the way you are doing it like , let’s choose EGKB Biggin Hill , DOVER2 departure rwy 21 , there is no min.climb gradient required so it’s standard 3.3% . The APG delivers you SPECIAL DEPARTURE PROCEDURE for rwy 21 , and now , in case of engine failure/fire you will follow this special procedure or you may follow SID because you met minimum climb gradient required or , maybe you will follow rwy heading ? I would personally follow SID because I have it already in FMS so it’s easier to follow and actually I’m not sure why APG put this special procedure to briefing pack when climb gradient requirements are met. A - An escape route is given ( Special departure) and you follow it should you have lost an engine after V1 regardless of the SID being cleared on; you Mayday Call is your password here. B- Nothing is even, that means you have to go Runway Track to 1500 AAL then you better have a plan.. ( MSA, Holding whatever), but you are sure of something, Straight Ahead for about 25 km , it is clear for you. What clearing obstacles means ? APG is sub-optimal, and really what shall be required is a per-SID max weight, only airlines do this. In the event of an engine failure using the non DP numbers, we are planning on you flying straight ahead to a max of 30NM. That is what our obstacle clearance is evaluating. Assuming you meet the certified climb requirements, yes you will be at or above 1500agl by 30NM. So you either follow the DP FROM APG (if available) or you fly straight ahead for max 30nm TO MEET OBST CLEARANCE. The SID goes out of the window with APG as soon as you are OEI. If you decide to load your aircraft to APG's weight for a certain RWY/airport, then you better follow it's published procedure regardless of what SID you were cleared on because chances are the APG procedure will allow you to take a lot more weight off that runway. Like CL300 "MAYDAY" is your password to get ATC's attention. We set up the APG departure procedure in FMS 3 and if required it is then switched to the PF's side so that he can follow it. Some places we go into are in mountainous areas, like KESE, KASE, LSZH to name a few. There is no way one could takeoff following the published SIDs and make it to destination on long flights, thus APG. But that doesn’t really answer the original posters question does it. If you are loaded such that your second segment climb is not restrictive for the SID you are on, would you still fly the escape in the event of a failure? Or would you follow the SID? If you are loaded such that your second segment climb is not restrictive for the SID you are on, would you still fly the escape in the event of a failure? Or would you follow the SID? If you are SURE you can maintain the gradient in the SID, sure you´d be able to stay on the SID. Now, how would you know that ? APG doesn`t give you the numbers, still you could look it up in the AFM or if you´re a Cessna Dude, you´d be able to use CESNAV. BUT....does ist cater for bank ? and...what gradient do you need ? Off RWY 21, passing 1,0 DME BIG you do almost a 270 with 185 KIAS max, no gradient given. I´d say if there is no DP given then the straight ahead thing is even easier than flying the SID, should the engine really quit right after V1. For my A/C sometimes the numbers with the non DP straight ahed thingy are HIGHER than the ones having a DP. For Biggin, APG has a DP for RWY 21 which gives us exactly the same numbers as the non-DP departure. For both flap settings we can choose. The other question is, what do you do should the engine failure occur way after V1 - I´d most likely then follow the SID anyhow. The irony here is that APG's DP for 21 at BQH is the SID. Straight out with APG is the default option but only if they don't publish a DP (or if they publish a non-DP set of weights). Straight out at Biggin 21 will take you into LGW inbounds within about 10nm assuming you can clear the high ground and obstacles. Many (not all) European APG DPs are one of the published SIDs in my experience. well its not an easy question to answer. I havent flown out of Biggin for years but if you carry on in a straight line you are flying straight at aircraft approaching Gatwick. You are totally reliant on ATC at Biggin coordinating immediately with Gatwick and the message getting through quickly enough. You will probably be too low to get an RA and you are flying towards rising ground. The SID, although turning, is over level ground and keeps you clear of traffic. In my aircraft I have data for the degredation in a turn at 15 degrees of bank so if I can make the gradient I am going to stick on the SID. In the case of Biggin I would probably be limited by the length of the runway but I haven’t actually done a perf for it. I just think its an interesting problem - my previous company mandated to pilots that they must use an escape if it was published. I tried pointing out that if I was departing 36L in Beijing and at 500 feet I commenced a turn straight across the climb outs of the other two runways I would be supremely unpopular but they werent having any of it..
..haha..me and Jon agreeing.. beelzebub will appear..
GURU says runway track to 2099 (1500). The bit it emphasizes is GROOVED RUNWAY (like I give a toss). Thanks GURU! not sure how that helps justify the wisdom of barrelling straight towards the approach of a major international airport whilst coping with a sick aeroplane. The geometry of the escape route is one thing - all too often they are published without considering the airmanship. It is quite important to reiterate the point that Guru or APG saying its fine does not relieve the crew from the duty of working out if its a good idea.. would you do it? I don’t know if you fly out of biggin much but is it what you plan? Would it be BIG or TAN or ALG or CSA or what else does not matter. Operator in public transport, part CAT or 135 have to assess the obstacles in the flight path. Runway is an easy one, obstacle not so easy. This is why we have a provider , for business aircrafts two main contenders Flygprestanda and APG ( although Jeppessen is carrying a product as well, I never worked with it). Both of them have one and only goal : How much weight can I go with today on this runway ? Considering that I will loose the engine at V1.... period. In this case one's can pull the wet finger, or always do the same. If there is an DP or Emergency flight path, you prepare it ( 2nd, 3rd or 4th FMS, VOR, NDB, whatever your manuals allows you to do for your plane), and if you loose the engine at V1 you just fly it. If there is no obstacle in you departure path ( that is an obstacle that you are not going to overfly by 35 ft.....) then straight ahead. We have to forget about the airspace around, a couple of traffic traffic while on Mayday does not harm much and keep people awake ( lol ), if you hit the ground this will be the last of your concerns ..
innit ? The aircraft I currently fly climbs so well OEI that I wouldn´t have to go straight ahead, but if your flying a well worn C650 or the like and its a hot day, you might have an issue with the turn degrading your performance. You´d be very low for a long time with such an aircraft even going straight anyhow and thus the G/As/Traffic at EGGW would not concern you much. NOTE: never ever in any regulation for OEI does it say: turn away and degrade your performance because of a major airport IN FRONT of you. I´d rather land into EGGW if, say, an engine is on fire. The Concorde dudes did try to reach the airport that was more or less straight ahead of them, Le Bourget. dude we are not disagreeing. I am suggesting that the performance calculators are not the bible and should be viewed as useful information but we should look at all the available info. I was asking if you (and by you I mean anyone reading the thread) if they would actually do it even if their aircraft could make the SID gradient and you have said, as I would have suspected, that you wouldn't. Not many business jets would. What I find a bit concerning is that some companies take it out of our hands and mandate that we have to fly the emergency procedure even if we make the gradient. Biggin is a good example of where that isn't a brilliant plan. The ground under the normal SID is undulating but the elevation doesn't significantly rise. It does rise by around 350 feet as you fly 2.5nm out in a straight line towards Gatwick. Also, I would suggest that you definitely would be in conflict with approaching traffic at Gatwick because we you start the take off roll at about 600 feet at Biggin so by the time you get to the approach path for Gatwick you would probably be at similar altitudes to the traffic on the ILS. I totally get that this isn't a primary concern when you are dealing with a failure but you need to get a mayday out (and you aviate, navigate, communicate so that may take a while) and then Biggin would contact Gatwick or the Gatwick approach controller would need to respond to the radar threat and start clearing traffic out of the way. I am sure that would happen but there is also the pinch of GA light traffic that bimbles along the M25 along the edge of the airspace at that point and I generally think it is a plan to be avoided if at all possible. And according to your answer you agree. 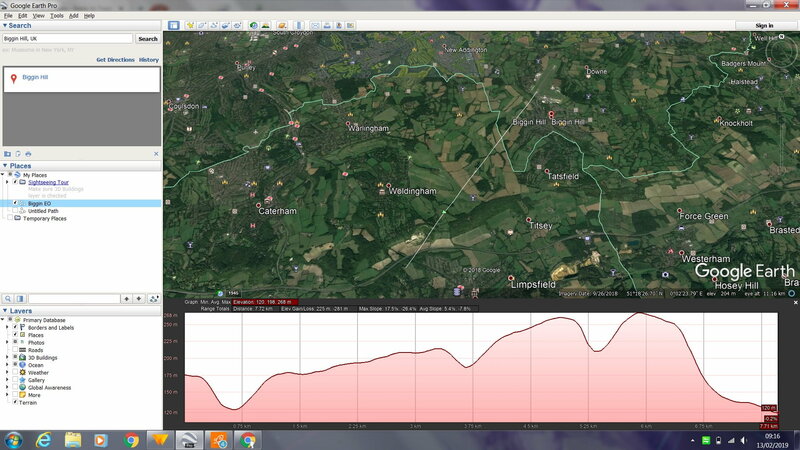 Its interesting to put the tracks into Google Earth and have a look at the elevation profiles for both cases. I am simply pointing out that Guru or APG or whichever perf calc program one has is not a bible. It is only a tool and I think its worth applying a bit of airmanship to the numbers. The elevation scales are not the same in the two images because I don't know how to make them the same. The ground rises by 15 metres following the SID and by almost 100 metres going straight. Its all just info eh..
and as I think I said, I am flying a plane that simply isn't that critical in terms of the climb gradient. I am suggesting that in many cases it is safer to fly the SID because we have the gradient to do so and to do otherwise adds workload to everyone involved. I am definitely not suggesting you stay on the SID if you don't have the performance. I have the figures for turning degredation available for the Global and I have used it many times to check that I really can stay on the SID. OTOH, BTT, the FAA apparently now wants one to check the all eng performance as well. Which I can´t cause the poor men at Cessna could´nt afford to put that (and lot of other info) into the AFM. Well thats interesting too. I am in a definite minority on the global in that I very much favour flapless departures for a whole variety of reasons. Very few other guys I know on the global do that because the training centres don't teach it. They don't teach it because the original GLEX wasnt approved for it. But the advantages are very clear. 2nd segment is a significantly improved gradient, the fin is more effective in the event of an engine failure because you are travelling faster when you leave the ground. The ailerons have improved roll control because of the reduced flap. And you don't need to be trimming right off the deck like you do with a flap6 departure (its usually trimmed perfectly for V2+20 in the initial climb) which means the autopilot will be available earlier and therefore a noise abatement profile is suddenly easy to fly. But crucially the climb performance in a 15 degree banked turn is degraded by 0.3 for a flap zero take off and by 0.55 for a flap 6 departure. 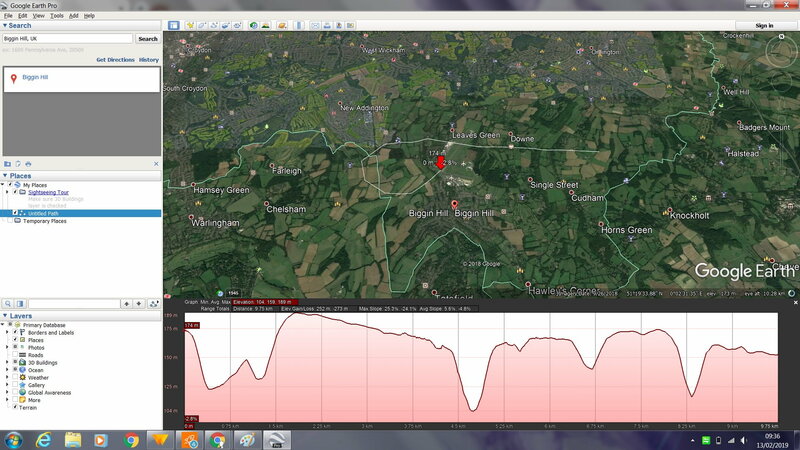 So the overall gradient for the profile is much easier to work out - I do it in excel by using the track miles. There are places where I definitely wouldn't follow GURU - Beijing is one. If you take off from 36L the EO procedure would be to struggle up to 500 feet and then turn right across the other two runways, both of which are also operating departures, and fly to the PEK south east of the airport. Theres no way I could get air traffic to understand what I was doing if that happened and we brief that we would follow the beginning of the SID and at 1000 feet or so go into a PPOS hold and climb as we dont have the gradient for the SID. That way I wouldnt crash into the hills or any other planes. There are others... I am not well off by the way. Those days have gone..
A number of different options have been discussed in training over the years from considering the deductions to climb gradient Glen has discussed depending on the AOB to setting V2+10 and allowing the use of full bank for following the SID or the EFATO procedure. It’s alway more of a discussion point than I think it should be. I think it should be black and white unless you have a very good reason for it not to be followed. Should one day we have to account for our actions the question would be asked why we chose to ignore a valid performance calculation. How did we determine in the heat of the moment, oh that gap over there looks alright, Ill turn here, there’s an airport over there etc etc and be completely, 100%, bet my life on it that I am right and I can still clear all the terrain and obstacles. Just because you can see where your going doesn’t mean you can clear all the terrain. If we use APG and it provides a procedure, and you accept that procedure to determine your MTOM you would have to have an exceptional reason for not following it. Once you have issued your Mayday you may do as you please in order to protect the safety of your aircraft, at MTOM that means following the APG procedure if it gave you one. You tell ATC what your doing and tell them to standby, then you get on with it. I would suggest there is a greater risk of hitting the ground if your wandering around and off your procudere than there is hitting another aircraft even if your routing does take you somewhere you would rather not go. Beijing is a great example by Glen where Guru used to suggest a right turn after departure ( maybe it still does I am on APG now ) on the northerly runways right across the departure tracks. I agree it would be challenging to get ATC to understand your intention, however, following that procedure would guarantee you terrain separation. Non approved methods ( even if correct, excel spreadsheets etc ) might be difficult to justify, I would suggest. After all, APG has done the work for you. Fortunatly, our APG now gives sensible procedures based on the RNAV departures so its follow the SID for a couple of waypoints and then take up the hold but it does sometimes throw up anomalies and as someone already said perhaps its not quite as good as it could be. Previous airline ops had the benefit of fewer and known airports but there would never be any discussion about not following the engine out procedure. You might have excess performance, you still flew the procedure because you would never really know how much extra you had, and if you started wandering off all over the place it was simply guesswork as to your terrain clearance. Just my thoughts but its a good question by the OP and one of my favorite subjects. By the way, I don’t have the APG data. GURU says straight ahead 1500 feet, don’t hit the easyJet. I wonder why APG and GURU are different as you mentioned the escape with GURU is almost the SID. Makes me want to understand exactly how they calculate things even more!